When it comes to trash handling, the German approach might first look a bit complicated. A lot of trash and waste is actually recycled if it is dumped into the correct bin. 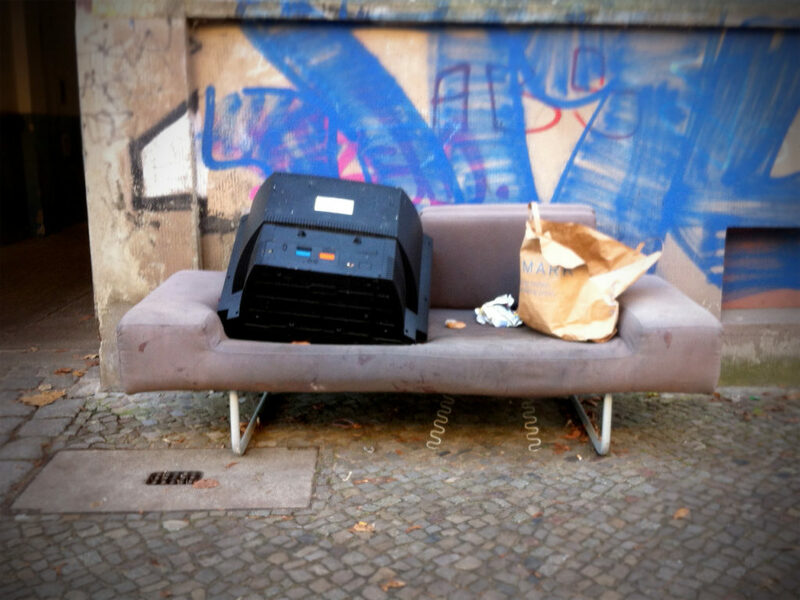 But the variety of both public trash bins and private trash bins you may find in your courtyard often remain a mystery to many Berlin travelers and nuBerliners. Different colors and shapes of recycling bins don’t really communicate, which bin is meant to be used for what kind of trash. And the labels, indicating what kind of waste should be put into what specific bin are either in German or dirty or missing. So I’ll try to shed some light at least on how trash and recycling is handled in Berlin. Currently Berlin has two major trash handling companies: the orange colored BSR (Berliner Stadtreinigung) and the blue colored ALBA. You may have recognized the large trash trucks driving around – the orange ones often labeled with more or less funny slogans like “We kehr for you”. Additional to the trash bins located in your court yard, there are also public bins available for some types of recyclable trash. Most of these public recycling boxes are for glass, some for clothes. And then there is the official Berlin trash dump – or actually several Recycling Centers – where you can bring larger chunks of trash and all kinds of things you don’t need or want any more for either little or no money. The easiest way to get rid of ‘old things’ is probably to bring them to one of the so called ‘Recycling Hof’ (Recycling Cente) of Berlin’s trash handling service BSR. Appliances and electronic devices like old TV Sets, computers, electronics, furniture, batteries, liquids, CDs etc. you can leave there for free. For some things however, trash that should actually go to the regular trash bins, you’ll have to pay a small fee. Donating Clothes, Shoes, Books, DVDs etc. Thanks for this, super helpful. Am currently working on a design project based on Berlin trash disposal, so any amount of information helps right now. Quick question, where should rubber items like rubber gloves be disposed of? Yellow or black bin or none?